Electric hedge trimmers are one of three different types you can buy with the others being cordless or gas powered. The main advantage of corded electric models is that they are the cheapest with prices ranging from $25 to $100. They also are quiet, small, lightweight, and provide good power for the price. The main disadvantage is that they are limited in range since they must be plugged into an outlet. Running an extension cord or several cords can get annoying and you also risk cutting the cord or unplugging it accidentally when in use. For home owners where you can reach the full extent of your property then a corded electric unit will work perfectly for your needs. Below we review our top 5 best electric hedge trimmers. Below these electric hedge trimmer reviews we also have a comparison chart so you can easily compare one model versus another. Our pick for the best electric hedge trimmer is the WORX WG209 which sells for about $62. Users rave that it is lightweight, well balanced, and easy to use. The 4 amp motor and 24 inch dual action blades provide plenty of power and allow it to have a cutting capacity of 3/4-inch. Weighing just 5.7 pounds makes it a joy to use whether you are cutting, hedging, or pruning. For residential users who can reach their entire property with an extension cord, then the WORX WG209 is our first choice for a hedge trimmer including gas or cordless models. If you need just a bit more power you can step up to the newer 4.5 amp Worx WG217 for just $10 more. A close second on our list is the Remington RM5124TH which is available for close to $70. It has a 5 amp motor and 24 inch dual action titanium coated blades. While the specs list a 3/4-inch cutting capacity we found that 5/8-inch is more accurate. It is a bit heavier than some other electric models at 6.4 pounds. The 180 degree rotating handle is a nice feature since it lets you adjust the unit to cut cleanly in a comfortable holding position. 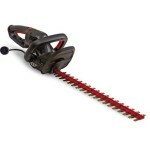 Overall we would recommend the Remington RM5124TH for all users looking for an electric hedge trimmer. A model that has been around for a few years and continues to score solid reviews from owners is the $70 Black & Decker HH2455. The HedgeHog, as it is known as, has a 3.3 amp motor that is a bit smaller than other top tier models and thus is not quite a heavy-duty unit. However, the 24 inch blades dual action blades can cut through branches up to 3/4-inch although it struggles a bit branches over a half-inch. Two nice features include a lock-on trigger so you don’t have to continuously pull the trigger and a swiveling handle with 5 positions to adjust to awkward positions. It weighs 6.5 pounds and is well balanced so it is pretty easy to use. We would recommend the HH2455 for all residential users. The cheapest electric hedge trimmer on our list is the $30 BLACK+DECKER BEHT100. It is also the best selling hedge trimmer on Amazon. The cutting capability is less than other electric models because it has just a 3 amp motor, 16-inch long blades, and a max cutting capacity of 5/8-inch. The biggest advantage of the BEHT100 is that it is extemely lightweight at just 4.55 pounds. This makes it a great choice for the elderly. 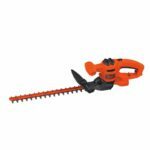 The BLACK+DECKER BEHT100 is ideal for anyone who only has a few bushes to trim right near their home and thus price and weight are more important than overall power and trimming capability. If you do need just a bit more power you can buy the BEHT150 with a 3.2 amp motor for just $4 more. Another decent option is the Greenworks 2200102 which sells for about $45. This electric trimmer has a 4 amp motor with 22-inch long blades and a cutting capacity of 9/16-inch. The cutting performance is worse than the Worx or Remington models, but better than the BEHT100 and the price reflects that. The 2200102 is the heaviest electric hedge trimmer on our list at 7.7 pounds. However, it has the longest warranty of 4 years.